Tyrosyl tRNA/aminoacyl-synthetase for the incorporation of L‑(7‑hydroxycoumarin‑4‑yl) ethylglycine (CouAA). For the labeling of a target protein in vivo a fluorescent amino acid should be incorporated through the amber stop codon. We provide a tRNA/aminacyl-synthetase (tRNA/aaRS) to the iGEM community to easily incorporate the fluorescent amino acid L‑(7‑hydroxycoumarin‑4‑yl) ethylglycin (CouAA) during translation in response to the amber stop codon. For the construction of the synthetase, we decided to use the Tyrosine tRNA/aminoacyl-synthetase from Methanococcus jannaschii with mutations at the following eight positions: Tyr32Glu, Leu65His, Ala67Gly, His70Gly, Phe108Tyr, Gln109His, Asp158Gly, and Leu162Gly, as described by Schultz, 2006. 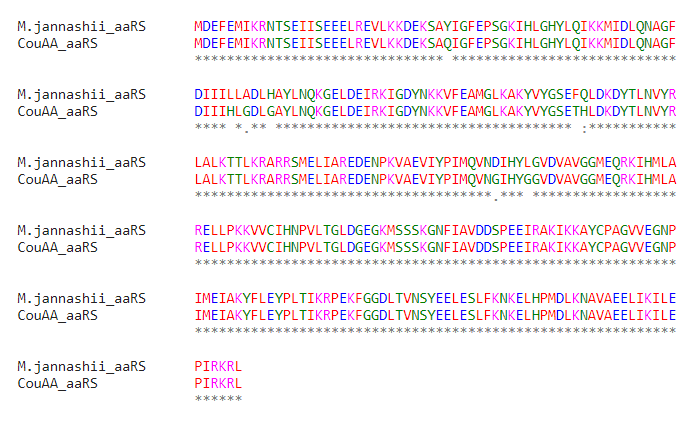 An alignment of the resulting synthetase and the wildtype are shown in Figure 1. We ordered the synthetase as gene synthesis and incorporated it via Gibson assembly in pSB1C3. For the experiments, the CDS for the synthetase needs to be on a low copy plasmid. Therefor we choose to insert it into pSB3T5 with a bio brick assembly. Figure 1:Amino acid sequences of the wildtype Methanococcus jannashii TyrRS and the evolved CouAA aaRS with Clustal Omega. To test whether the synthetase really incorporates CouAA, we transformed the synthetase in pSB3T5 and our composite part BBa_ K2201331 as test protein in E. coli BL21 DE3. The part K2201231 contains the CDS for the protein Sup35 with an amber stop codon at position 21 under control of a T7-promoter. If the synthetase works, it will incorporate CouAA in response to the amber codon at position 21. However, we expressed the test protein, which contains a histidine tag, and purified it through NiNTA chromatography. After the purification, the absorbance and emission spectra of the purified protein were measured via UV/VIS-spectralphotometer. The spectra of the purified protein and the spectra of CouAA in LB-media are shown in Figure 2. Figure 2:Adsorption and emission spectra of CouAA in LB (left) and incorporated into the protein Sup35 (right). The two spectra shown in Figure 2 look very similar to the spectra recorded by Wang 2006. Little variances in the absorbance spectra could be caused by different media or in the elution buffer of the eluate. A comparison of the fluorescence of Sup35 containing CouAA and a negative control containing cysteine at the same position are shown in Figure 3. 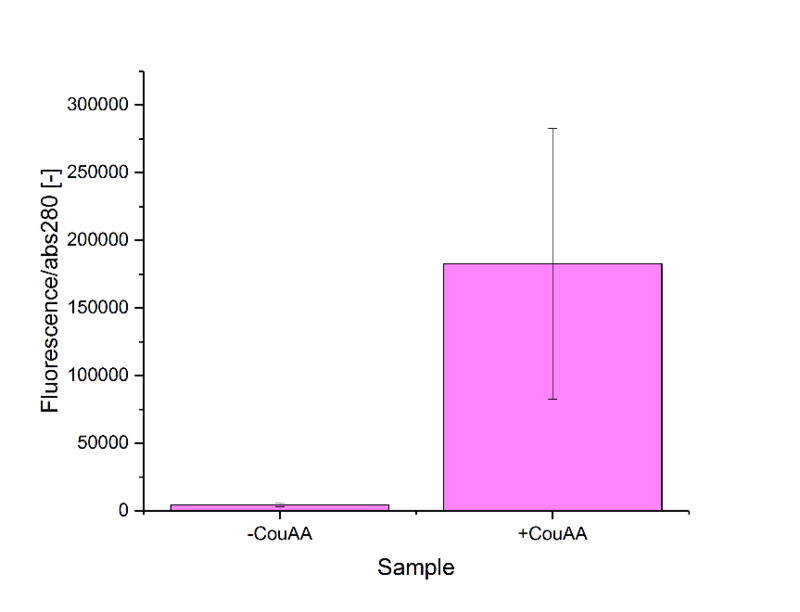 Figure 3:Fluorescence intensity normalized on the absorbance at 280nm (indicator for the protein amount) of purified Sup35 containing a cysteine at position 21 (-CouAA) and containing the fluorescent amino acid CouAA at position 21 (+CouAA). The fluorescence intensity of CouAA normalized to the absorbance at 280 nm is significant higher than the fluorescence of the negative control. This proves that our evolved aaRS incorporates CouAA in response to the amber stop codon. Furthermore, we wanted to proof that labeling in vivo is possible. To prove the labeling in vivo the cotransformants with BBa_K2201204 in pSB3T5 and BBa_K2201331 in pSB1C3 were cultivated in LB containing 1 mM CouAA. After 8 h of cultivation like described in the expression of recombinant proteins, 1 mL of the culture were washed with 1xPBS and diluted 1:10. To immobilize the cell for fluorescence microscopy, 100 µL of the cells were mixed with 100 µL 2 % agarose. 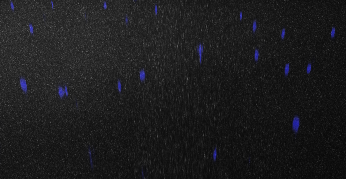 The fluorescence microscopy was performed with confocal laser scanning microscope using a DAPI filter to detect the fluorescence signal of CouAA. Figure 4:Confocal laser scanning microscopy of Sup35 containing CouAA at amino acid position 21. The fluorescence of CouAA was visible through a DAPI filter. The fluorescence microscopy in Figure 4 shows a constant fluorescence signal from CouAA in Sup35 in the whole cell. Sup35 seems to be localized in the whole cytoplasm. All in all, the labeling tool for localization in vivo and in vitro worked fine. We were able to provide a functional aaRS for the incorporation of a strong fluorescence amino acid to the iGEM community.